A new bill, just signed into law by President Putin, requires proxies, VPNs, Tor and other anonymizing services to prohibit access to blocked domains. If these services fail to comply, they will be blocked themselves. Search engines also face sanctions for linking to banned sites. Russia has swiftly become a world leader when it comes to website blocking. Tens of thousands of websites are blocked in the country on copyright infringement and a wide range of other grounds. However, as is often the case, not all citizens willingly subject themselves to these type of restrictions. On the contrary, many use proxies or anonymizing services such as VPNs and Tor to gain access. In recent months, the Russian Government has worked on legislation to crack down on these circumvention tools as well, and local media report that President Vladimir Putin has now signed the proposed bill into law. Under the new law, local telecoms watchdog Rozcomnadzor will keep a list of banned domains while identifying sites, services, and software that provide access to them. Rozcomnadzor will then try to contact the operators of the services, urging them to ban the blocked websites, or face the same fate. The FSB and the Ministry of Internal Affairs will be tasked with monitoring offenses, which they will then refer to the telecoms watchdog. In addition to targeting the circumvention sites, services, and their hosts, the bill targets search engines as well. 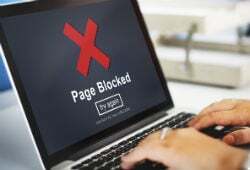 Search engines will be required to remove links to blocked resources from their results, as these would encourage people to access prohibited material. Search engines that fail to comply with the new requirements face a $12,400 penalty per breach. Local search giant Yandex previously spoke out against the far-reaching requirements, describing them as unnecessary. “Even if the reference to a [banned] resource does appear in search results, it does not mean that by clicking on it the user will get access, if it was already blocked by ISPs or in any other ways,” the company added. The new legislation has not been without controversy. Earlier this month many Russians protested the plans, but this had little effect on the final vote. In the Duma, the bill was approved by 373 deputies. Only two voted against the plans, and another and two abstained.